Flahavan’s, an Irish milling company famous for its porridge oats, doesn’t have a problem keeping its staff. One, Stephen Morrissey, has been with the company for 50 years – and he’s only 64. He says he has no plans to retire. John Flahavan, the sixth generation owner and managing director of the food company, is proud of his staff’s loyalty. He says there are workers who have had four generations of their family work at the mill. And there are plenty of others who, like Morrissey, have done 50-plus years of service with the company. “Most of them come from the local community, where the business has strong connections,” John says. Indeed, the business’s roots could hardly be deeper. John says there has been a mill connected to the family in Kilmacthomas in the county of Waterford in the southeast of Ireland since 1656. The Flahavans have seen a lot in between now and then. In more recent times, Flahavan’s was one of the first companies to advertise on Irish TV when it was launched in 1963. That, and the nurturing of its brand over many years, have helped to ingrain Flahavan’s firmly into the Irish psyche. Much of that growth, certainly since the 1990s, looks to have come from the efforts of John and his immediate family – and, of course, his loyal staff. He inherited around 16% of the shares in the business after his father died in the early 1990s, but gradually bought the part of the business held by cousins and siblings. “With businesses as old as ours, shareholding often becomes pretty diluted,” he says. In the late 1990s, after buying his brother’s shares, John and his wife Mary ended up as the sole owners of Flahavan’s. Around about the same time, a big push was made to sell new oat products like muesli, oatmeal cookies and flapjacks. Efforts were also made to grow the brand internationally, first into the UK and later into the US and beyond. Flahavan’s products are now sold in more than 1,200 stores throughout the US, which is a big market for porridge oats with total sales worth at least $1.2 billion a year, says John Noonan, marketing director at Flahavan’s. Inroads have been made into South Korea, where the porridge maker has done well on the back of a campaign by the government to introduce more fibre into the diets of Koreans. Other growing markets include Spain, Russia and India, says Noonan. The health benefits of porridge oats have been a great boon to the sales of Flahavan’s, adds Noonan. The company has also done a lot to nurture its organic and environmental credentials. Flahavan’s recycles the water it takes from the millstream at the River Mahon to generate some of the electricity that powers its mill. And the grain’s outer shell is burned to fuel the boiler, generating the steam needed for the production process. Now 62, John isn’t thinking about retiring any time soon. But the next generation are very much actively involved in the business. Eldest daughter Annie, an ex-KPMG accountant, now works full time for Flahavan’s and son James works in growing the porridge maker’s international business. The current boss is very wary of outstaying his welcome. “My father and uncle were slow to release the reins of power,” he says. Both worked into their 80s. 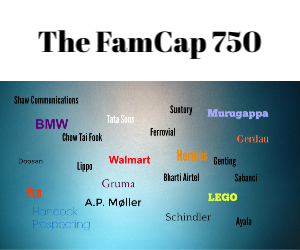 Although it might seem like a sacrilegious question to ask a business with such a strong family culture, could the family one day be tempted to sell? There’s no doubt that a brand like Flahavan’s would present a tasty acquisition target for one of the big global food companies. After all, Quaker Oats, an American producer of porridge oats, was bought by PepsiCo Inc. in 2001. John won’t be pushed on this, but says that “a multinational can’t come and talk to you about the business as a family can.” Which suggests that his loyalty, to his own family and the others who have worked at the business, remains strong. More generations of Kilmacthomas residents can probably start planning their careers.